November is upon us and inevitably we are experiencing the colder weather and the first signs of the Holiday Season all around us. Decorations and music are appearing in retail stores. Magazines are sharing their best holiday recipes and menus. And the calendar is filling up with seasonal party invitations. It is such a “Merry” time. So You Want Me to Be Your Executor? It is not difficult to find a list of things that someone should consider before they dry the ink on their will and name the Executor. These are important lists because there are countless tales of estates in disarray because not enough thought was given to the Executor selection. But I’m also surprised that I don’t see more lists that advise potential Executors on what they need to consider, or ask, before they accept the responsibility. I know that the first time I was asked I just said “Yes!”, I was so honoured to have been asked. And the first time I actually had to act as an Executor I quickly realized how much I wished I had asked (in this case) my aunt more questions. It is easy to know some of the basics, but the devil is in the details and many of the ‘little things’. And I was never sure if we handled some of those in a way that would have made her happy. So here is the start of a list of questions, and I invite you to suggest others that need to be asked. 1. Have you preplanned your funeral and documented what you want? 2. If not, would I have to pay the funeral expenses until the estate reimburses me? 3. Do you have a list somewhere of everyone you want to be notified of your death? 4. Are there possessions you have that aren’t listed in the will that you want to go to specific people? I look forward to your comments and input! Two blogs back I mentioned that I had sent Francis a copy of the booklet “When Someone You Care About Dies” by Dr. Bill Webster. 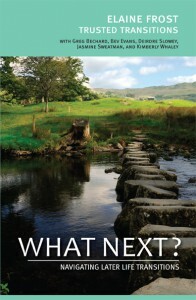 Until quantities last, we are offering a copy of this booklet, without cost, to readers who respond. Send an email to moc.snoitisnartdetsurtnull@ofni with the subject “Dr. Bill Webster’s Booklet” including your name and full mailing address and we will send you out a copy. Grief is such a personal response. There is no right or wrong way to deal with it, though many try and bury it beneath a facade of “I am OK” as a way to cope. As with many of life’s difficult experiences, if they are “shelved”, “put on the back burner” or ignored, we never quite heal. Another event happens and the reaction sometimes multiplies as each experience is not truly acknowledged. He also delves into other life losses. “Any loss that causes a significant change to our lives is a life loss. Death is not the only significant life loss to cause a grief response.” When read, this statement brought with it a flood of personal scenarios, one of which was retiring from IBM. I now believe I mourned that transition. His outline of realities to be dealt with after a loss will help us cope not only with our losses, but help us understand the impact of losses to others. He makes frequent suggestions of self discovery as you deal with your loss that I am sure will help all who take the time to review. The ending of his booklet provides some uplifting thoughts we need to hold on to. If you or someone you know may benefit from receiving this booklet, contact us with the information requested above and we will send it out to you. When someone dies – how do you cope? Bob and Francis moved to my street almost 8 years ago. She was Irish. He was Portuguese, and 10 years younger. His first marriage; her second. They were obviously in love. Bob just beamed when he told me that he had to buy the house for Francis because he KNEW she loved its most amazing kitchen! Two years ago they moved to a house in little Portugal in Toronto where it wouldn’t be as hard for Bob to maintain the home. You see, a few years after moving onto our street, Bob got colon cancer. Throughout his treatments, his high spirits made us forget he was sick. He was, in fact, very sick. Sadly, days before this Christmas, Bob died at just 49. I and many other past neighbours were at the visitation. I think that says a lot about who they are. Speaking with Francis that week was hard. Though she was devastated and in grief, she acknowledged friends and their questions at the visitation by telling them she was “OK “ or “ I’m fine”. I wondered – “Really?” I know when my Mom died I said the same thing. But I wasn’t. Not truthfully. Her reaction also reminded me of something I had read in a booklet Elaine had given me. “When Someone You Care About Dies” by Dr. Bill Webster. Dr. Bill Webster speaks from personal experience. His wife Carolyn died at a young age from a heart attack. Francis has gone out of town for a few days so I put the booklet in the mail to her today. I am sending it to her in hopes that it helps her through this time. It is written softly though with strong messages that I am hoping will lend calm and clarity to her grief journey.